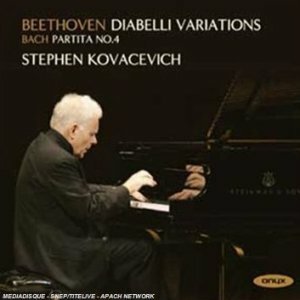 It is with unequivocal clarity that Stephen Kovacevich discloses how vitally significant Beethoven's monumental set of 33 Variations in C major on a Waltz by Anton Diabelli, Op. 120 is to him. An astonishing voyage of pleasure, passion, pun and pathos, this work has been a steadfast companion throughout the pianist's career, not least at his UK debut at the Wigmore Hall in 1961 and in the highly-acclaimed studio recording for the Philips label in 1968. Forty years on, the deeply personal connection that Kovacevich has with this piece has matured and strengthened, resulting in a fresh performance of powerful and poignant solemnity. Nowhere is this more vivid than after the bristly staccato chords of Var. 29. The ensuing three chapters of the work – all in the tonic minor – convey a cavernously sombre gravity distinctive to the great performances of Beethoven's late works. Kovacevich's scalic flourishes in Var. 32, which would likely emerge tersely from the hand of any ordinary musician, simultaneously sing to and plead with the listener. The seemingly insurmountable construct of tenderness and yearning that both composer and performer have completed at the end of this variation is then violently shattered by Beethoven's heroic fugal proclamation in E-flat major, performed here by Kovacevich with an irresistibly con fuoco mentality. It is nostalgia, however, which returns after this momentary eruption of triumph and defiance, as the pianist's magnanimous expressivity draws the listener into an distant aura of both reflection and longing. Of course, the final five variations would not be nearly as dramatic without the first twenty-eight, and numerous episodes earlier in the performance merit particular commendation. Kovacevich's quasi-operatic cantabile in the more measured variations is to be greatly treasured, not least in the delicately-paced Fughetta of Var. 24. The rich textures of Var. 14 and Var. 20 are pensively surveyed, played with the utmost clarity and conviction. All of these abilities are juxtaposed in the dark yet compassionate realm of Var. 8, resulting in a reading of the most transcendent beauty. Kovacevich is equally adept in the quicker, more boisterous movements. He exudes an amusing mischievousness in both the almost child-like petulance of Var. 9 and the ludicrously contrasted dynamics of Var. 13, whilst the broken octaves in the left hand of Var. 17 drive the music on in a most rousing manner. The Diabelli Variations are coupled with Bach's Partita No. 4 in D major, BWV 828 which, intriguingly, is the pianist's first ever Bach recording. At its heart lies the expansive Allemande, which Kovacevich renders with sublime, dolce sensitivity. His phrasing is wonderfully subtle, offering countless moments of grace and expressivity without ever becoming overbearing. Given the ethereal state one finds oneself in when this movement unfortunately reaches its conclusion, it's a shame that the Sarabande – which has similar melodic and harmonic potential – is subject to a comparatively rigid approach. Whilst signifying more of a mixed bag in comparison with the Beethoven, this performance nevertheless makes for decidedly worthwhile listening. After a somewhat static introduction, Kovacevich injects a delightfully infectious lilt into the compound time of the Ouverture's fugue; the Courante is humorously perky and playful; and Kovacevich's intricate interpretive divergence in the Gigue's repeated A section is exquisitely conceived. The recorded sound fashioned by engineer Mike Clements brims with vivacity. Balance is excellent throughout the range of the instrument, and the acoustic offers enough sympathy without being overly resonant. Though one can intermittently hear the pianist's inhalations, this only adds to the palpable impression of this performance as one recorded live in concert as opposed to during a studio session. Accompanied by Joseph Kerman's eloquent booklet essay and the typically refined presentation that one has come to expect from Onyx Classics, this disc is an ideal tonic for those post-Christmas blues and a valuable addition to any CD collection.